1895. 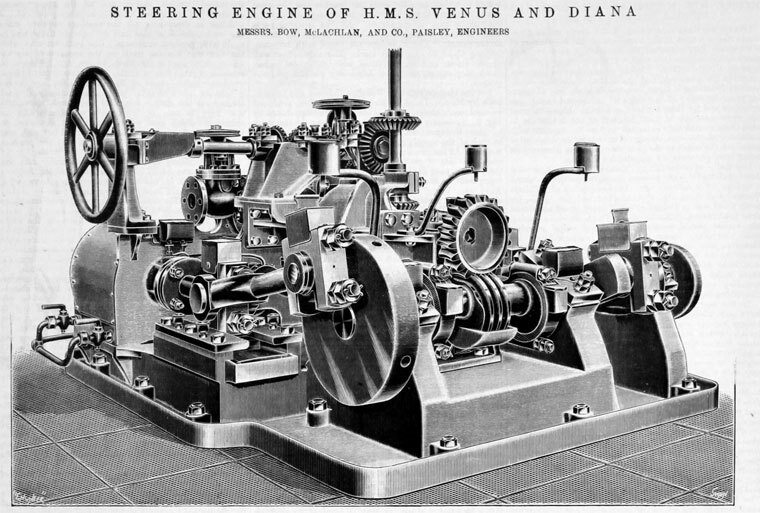 Steering engine of HMS Venus and Diana. 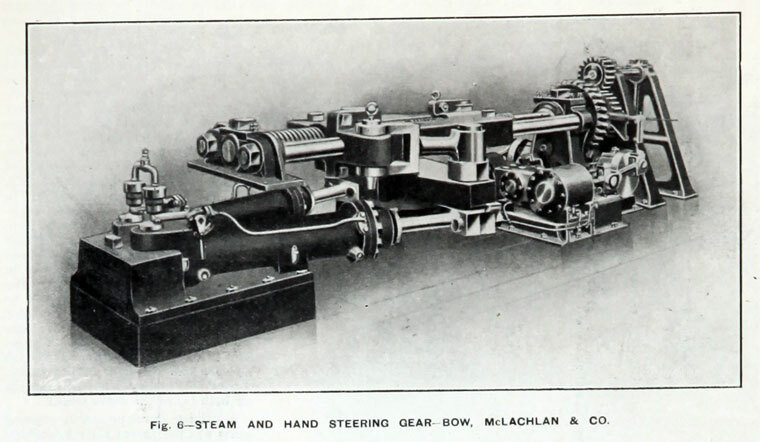 Steam and Hand Steering Gear. 1907. 1872 William Bow and John McLachlan established the firm of Bow McLachlan and Co at Abbotsinch, Renfrewshire, Scotland. Initially manufacturers of steering gear and light marine engines, the business turned to shipbuilding, following the acquisition of the Thistle Works, Paisley, Renfrewshire, in 1900. 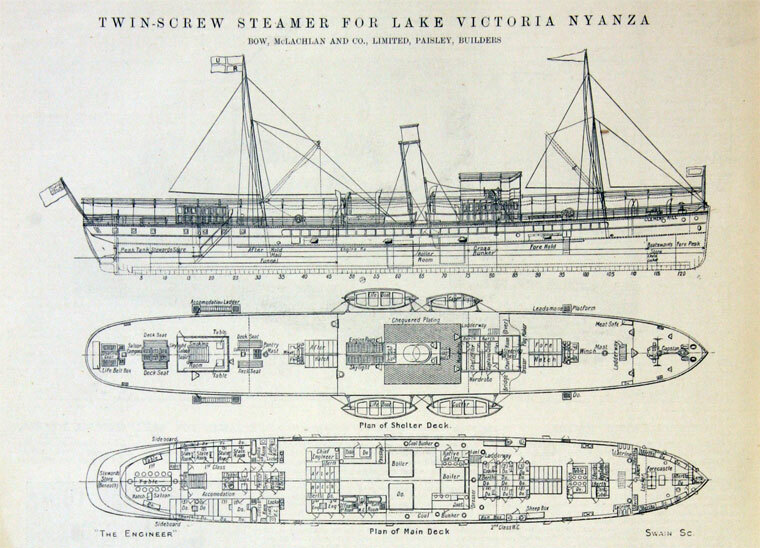 Their specialisation at this point was the manufacture of vessels supplied in kit form. 1900 Mr J. M. Dewar was appointed general manager of the Paisley firm. 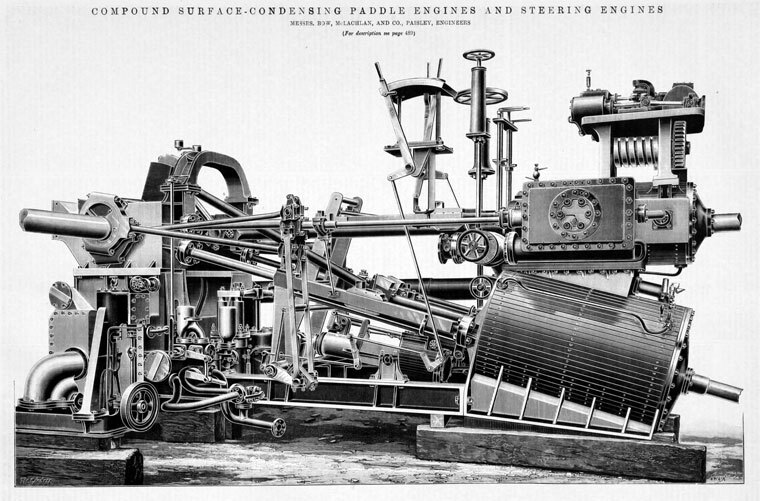 1900s Various ships were made for Canadian companies including the Salvage King a deep-sea steam salvage tug that was used in many ocean rescues. The yard also built coastal steamers. WWI The yard mainly built small warships. Captain Bow, Director of Bow, McLachlan and Co was killed at South Shields ca. 1920 when a lifting chain broke bringing a triple expansion engine down on top of him. This tragic accident was probably the catalyst which caused the 1920 closure of his firm Bow McLachlan & Co Thistle Engine Works & Shipyard Paisley. 1920s The yard made coasters for Greek, Indian, and Australian companies. 1930s The yard made a coastal tanker for a Finnish company before a series of six naval tugs for Chile. The company also made the paddle tug John H. Amos and this vessel is still in use today. 1932 The company went into liquidation and the yard was closed, although it did open briefly in World War II to build landing craft. The Thistle Works were purchased by National Shipbuilders Security, London. ↑ The Engineer 1900/04/13 p 394. This page was last edited on 29 July 2015, at 12:59.